Full Moon Resort offers a wonderful, eclectic array of simple, affordable country-inn style accommodations at its various lodges and cottages. 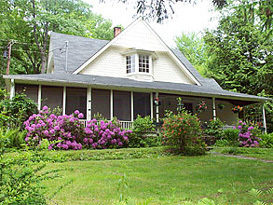 The centerpiece of Full Moon, a turn-of-the-century Catskill country inn known as the Valley View House, features charming B&B style guest-rooms (with shared hallway baths), a wrap-around sun porch, lobby, library and café. 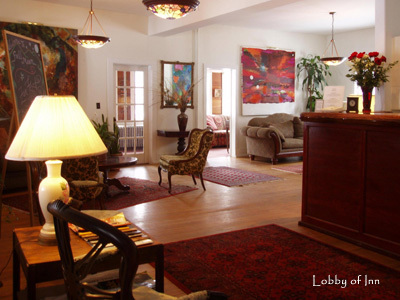 Surrounded by original artwork (featuring regional artists Sharon Broit, Durga Bernhard and Jessica Galkin) in the hotel's welcoming lobby and guest registration area, guests relax on comfortable couches and enjoy complimentary coffees and teas. Of course, the heart of every home is the kitchen. 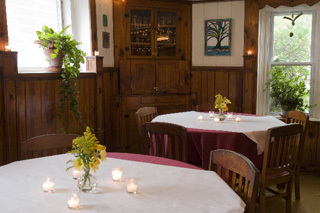 The Café, located at the first floor of the inn, features tasty country buffet breakfasts and lunches for wedding guest... as well as superb dinners for retreats and conferences. The Valley View House serves as a central meeting place and nexus of activity for every event at Full Moon Resort. 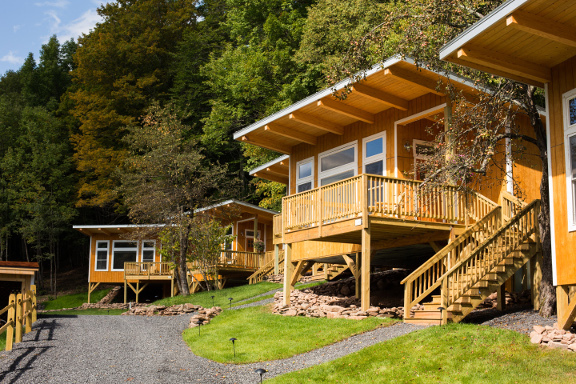 The newly constructed Mountain Sky Cottages are four-star, exquisite mountainside accommodations. Private decks with Adirondack chairs and dramatic vistas. Expertly detailed interiors with king bed, sitting area with comfy couches and chairs, picture-windows with panoramic views, colorfully inspired original works of art and ceramic/slate baths with over-sized showers. Dancing Bear and Shady Grove Cottages, also new, offer deluxe amenities in addition to being centrally located to all Full Moon Resort's function rooms and activities. 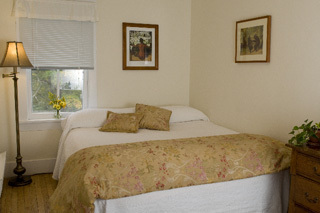 Beyond a place to simply relax and sleep, all of the new cottages present a true lodging experience! 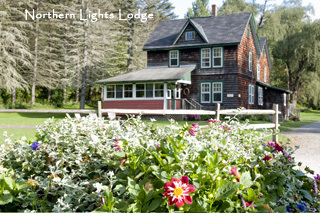 Northern Lights Lodge, a cedar-shake building adjacent to the main lodge, offers guest rooms with either private or hall baths. 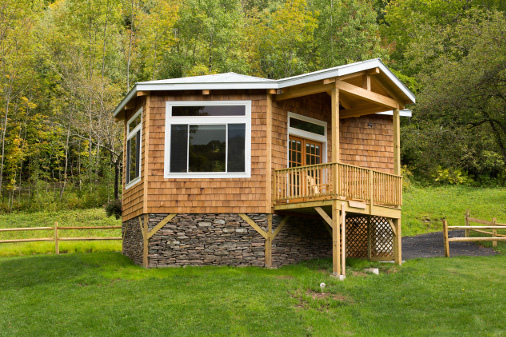 This lodge has a charming common ante-room with a small library. 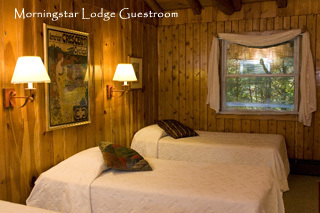 Rustic Morningstar Lodge, with a panoramic mountain view, has larger rooms, dressed in cedar and pine... all with artistically renovated 1950’s private baths. Streamside and Birdsong Cottages, are perfect for families or anyone interested in setting up house for the duration of their stay. In addition to the accommodations at Full Moon Resort, adjacent affiliated properties including an additional lodge and cottages may be utilized (subject to availability). These locations may also be available for seasonal rentals. Moonlight Lodge, a lovely 1890's country house, features a full kitchen with oak table, living room with library, glass-enclosed sunporch, screened porch and two newly renovated baths. The Wainscott ceilings on the second floor give this lodge an old-fashioned Victorian feel. Three smaller cottages nearby: Evergreen, Mountainview and Night Sky, are also wonderful options for wedding parties, weekly and seasonal rentals. 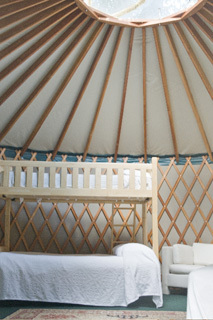 For guests interested in being closer to Mother Nature, tent camping on the fields and meadows, or an evening in the Yurt are options. Restrooms with showers and changing rooms are provided.